In the mid-twentieth century, American Catholic churches began to shed the ubiquitous spires, stained glass, and gargoyles of their European forebears, turning instead toward startling and more angular structures of steel, plate glass, and concrete. But how did an institution like the Catholic Church, so often seen as steeped in inflexible traditions, come to welcome this modernist trend? Catherine R. Osborne’s innovative new book finds the answer: the alignment between postwar advancements in technology and design and evolutionary thought within the burgeoning American Catholic community. A new, visibly contemporary approach to design, church leaders thought, could lead to the rebirth of the church community of the future. As Osborne explains, the engineering breakthroughs that made modernist churches feasible themselves raised questions that were, for many Catholics, fundamentally theological. Couldn’t technological improvements engender worship spaces that better reflected God’s presence in the contemporary world? 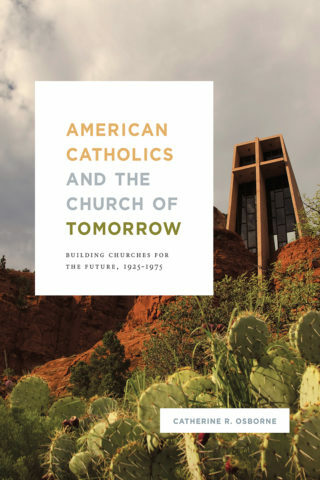 Detailing the social, architectural, and theological movements that made modern churches possible, American Catholics and the Churches of Tomorrow breaks important new ground in the history of American Catholicism, and also presents new lines of thought for scholars attracted to modern architectural and urban history.